Activeion Ionator HOM multi-surface power cleaner quickly and easily removes dirt and kills 99.9% of harmful germs without the use of chemicals! It's a great green way to clean your kitchen, bedrooms, bathrooms, and playrooms WITHOUT any chemical residue - or the expense and packaging waste of typical household cleaning products. Just charge it up, fill it up, and clean it up - it's that easy! Two Technologies Tackle Dirt and Germs! Activeion is the first to combine the science of electrolysis and electroporation into a small, handheld and powerful cleaning appliance. When you press the trigger, the water is imparted with a slight electrical charge. 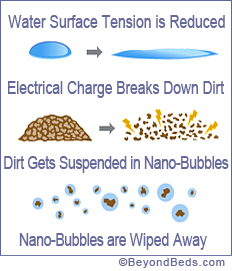 The water is then separated into an oxygenated mixture of positively and negatively electrically charged nano-bubbles. A Revolutionary Home Cleaning Breakthrough! Use Activeion ionator HOM to clean natural stone (such as granite or marble), glass, stainless steel, cabinets, fabrics, and more. The electrically charged ionized water attracts dirt like a magnet helping to lift it from the surface and allowing it to be wiped away. Activeion HOM is designed for quick, easy and chemical-free cleaning virtually anywhere in your home, car, or office. When used as directed, Activeion HOM kills the 2009 Pandemic H1N1 Influenza A virus and more than 99.9% of most harmful bacteria (Salmonella, MRSA, Staph, Pseudomonas, E. coli, VRE, and Listeria) on nonporous hard surfaces with a 6-second spray. The principal scientific process behind the germ-killing power of the Activeion HOM is electroporation, which applies a low level electric field to the target cell (in this case, a bacteria or virus). This electric field creates holes in the membrane of the cell, also referred to as " porating" the cell wall. Where some scientific applications of electroporation have temporary effects on the cells, the Activeion technology is not reversible, it completely breaks down the walls of bacterial cells, pathogenic viruses and other germs. Fill your Activeion HOM with ordinary tap water. DO NOT use distilled or purified water. Pre-clean surfaces with the Activeion HOM to remove excess soils. Spray the surface to be cleaned for 6 seconds at a distance of 3-4 inches and wipe the surface dry with a clean cloth. Maintenance: clean the internal reservoir every month by simply running warm water through the unit. Battery Life: Built-in rechargeable 12 volt nickel-metal hydride (NiMH) battery pack. Expected battery life 5+ years. A single full charge activates approximately 1 gallon of tap water. Smart charge circuitry prevents overcharging. Warranty: 1 year, residential use.